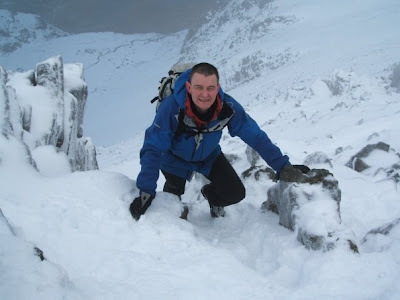 More club members have been out enjoying the snow this year. 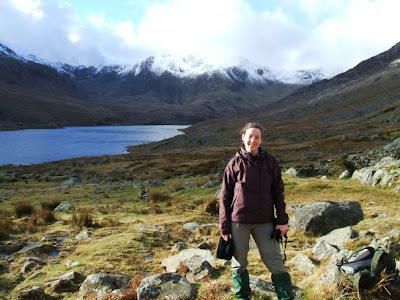 Here are a few photos from Gail and Andy's recent trip round the Carneddau. 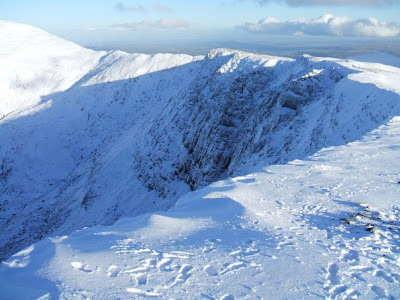 GrahamC was out enjoying the snow on Helvellyn on Saturday. Here are a few photos just to let us know what we missed. KenF has sent us a photograph of Fairy Glen from the recently advertised Winter Walk on Sunday 11th January from Parbold Hill to Ashurst Beacon(Dont't forget that you can click on any photos in this blog to see the picture in a larger format). According to the local council, this is "one of the most picturesque woodlands in the district." 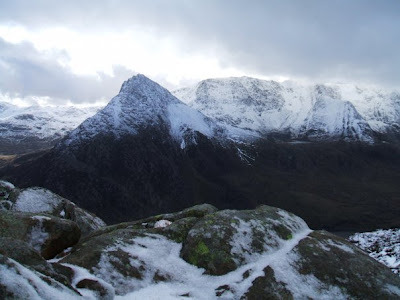 "The secluded atmosphere of the Glen provides an ideal home for a variety of wildlife. Designated as a Biological Heritage Site for its ancient woodland of oak, birch, ash and alder, the woodland floor may be covered with bluebells, wild garlic, ferns, and red campion. The waters of Sprodley Brook have, over time, cut down through the underlying sandstone to create the steep Fairy Glen valley, which has spectacular waterfalls and cliff faces." The more widely travelled amongst our readers will no doubt also have visited some of the other Fairy Glens scattered around the British Isles. Wales is claiming at least three. 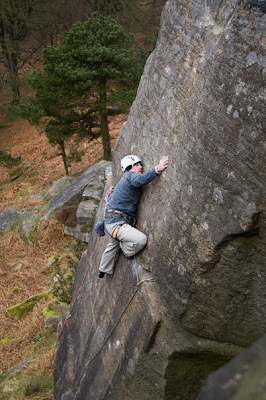 Firstly there is the most well known one near Betws-y-Coed not far from the Fairy Glenn Inn. Next is one near Capelulo at the Dwygyfylchi end of the Sychnant Pass. And they also claim to have one near Colwyn Bay following the course of the Afon Colwyn into the heart of Old Colwyn. Not to be outdone, the Scots have at least two. Glen Conon, also known as Fairy Glen, is an unusual landscape near Uig, on the Trotternish peninsula on the Isle of Skye. Described as a "bizarre and delightful miniature landscape of grassy, cone-shaped hills," it was apparently formed by a combination of landslides and subsequent glaciation. There is also a Fairy Glen near Rosemarkie, north of Inverness which is part of an RSPB bird sanctuary. It would make an amusing project to research and visit all the Fairy Glens in Britain and it should be easier than doing all the Munros. Any takers? 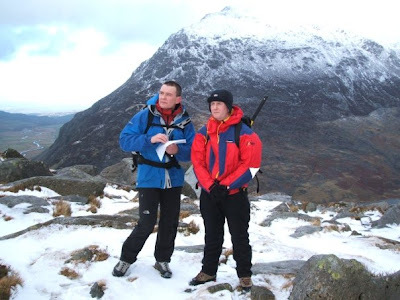 More photos, no details yet but it looks like PaulV and DaveC have been out enjoying the snow in Wales. 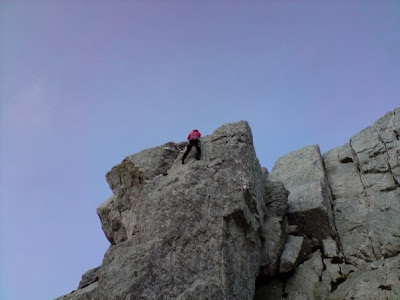 A few photos have come to light of PaulV climbing on Holyhead Mountain. It is an enjoyable and convenient venue with a good variety of routes and grades. 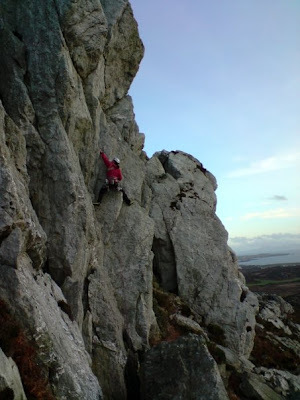 Also good for when conditions aren't quite right for something at Gogarth. My son Philip and I, joined my son Simon and his wife, to visit her folks in Porto Alegre in the south of Brazil. 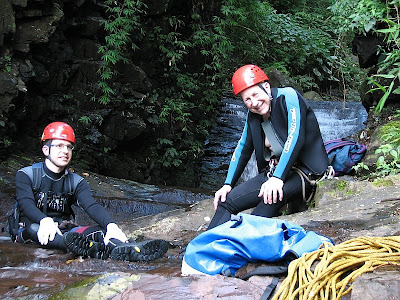 We also had two “activity” objectives: visiting the Iguazu waterfalls and canyoning in the Serra do Mar hills, some 200km north east of Porto Alegre. Although visiting the Falls is not a mountaineering activity, it is worth reporting on because the falls are the world’s second biggest, after Victoria Falls (and peak water flow is almost 2½ x that of Niagara), and are particularly interesting because the waterfall system, up to 80m high, consists of about 270 cataracts, some quite small, along 2.7km of the Iguazu river. There are many islands that split this length. The largest fall, the Devil’s Throat, is U-shaped, 150m wide and 700m long, and it is at the border of Brazil and Argentina. 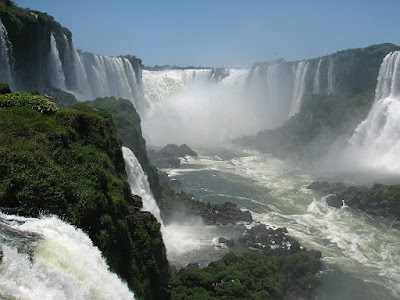 Brazil has only one viewing path, while Argentina has several, with spectacular viewing platforms right next to the falls. You have to be there to appreciate the immensity of these falls, the power and roar of the water as you stand, secure, next to or above it, gazing in awe at the spray and rainbow as the water plunges into the depths, and the river beyond flows rapidly and deep. The canopy of the surrounding dense sub-tropical forest adds mystery. 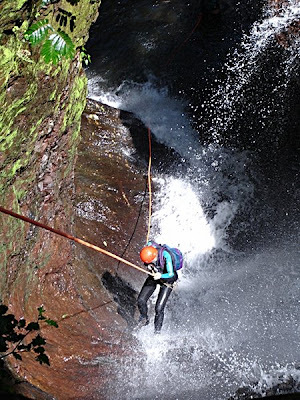 Our canyoning trip occurred after Christmas. 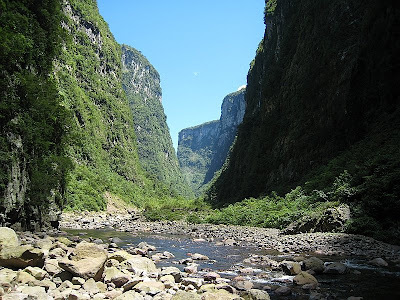 The first day’s walk followed one of the big canyons up stream and back down it, criss-crossing it more than 15 times in each direction. 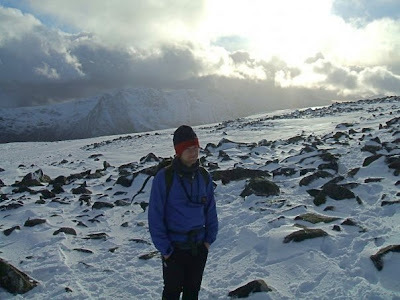 Wearing boots for ankle support and rucksacks with dry liners, we waded through the stream, thigh deep over slippery boulders in the morning but, tiring later, achieving full immersion several times. Who cares? The water was warm. Hazards included snakes, marked by 3 cairns and a stick, and spiders sunning themselves on dry rocks. The tops of the canyon were limestone but wherever there were ledges and slopes forest took over. On the second day we 4 Brentfords, the guide and his brother went in a 4-wheel pick-up truck to the top of an unmade road, and worked our way down along a sort of path through the forest, wearing protective gloves against spiky tree bark, stinging plants and hairy caterpillars, and took care not to trip over lianas and roots. 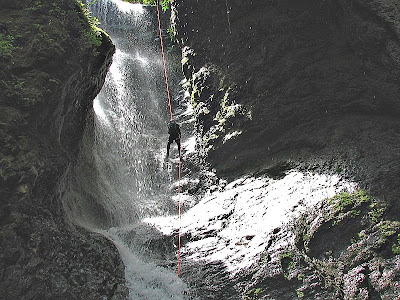 When we reached a stream we donned wet suits, helmets and harnesses, and followed the stream over boulders, through pools, and over 11 waterfalls, where the guide had fixed bolts or used secure trees for abseiling, the falls varying in height between 10m and 40m. There were two ropes used, one a caving rope. I found the swirl of the water quite disorientating at times, the rock was slippery and, despite trying to keep one’s body square to the rock, we all had the occasional slip. 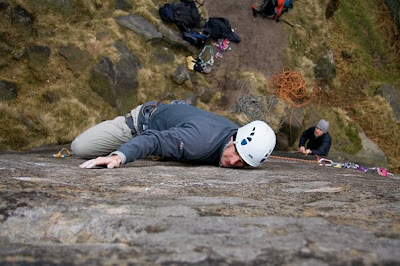 A safety rope wasn’t necessary and usually the first person down held on to the bottom of the rope in case it needed tautening should one slip. After an exhilarating adrenalin-assisted day, admiring the flora, avoiding the spiders (no snakes here) but not the mosquitoes, we found an amazing spread of food and drink laid out for as at the local Café Rural and, after peeling off wet clothing, tucked into it. 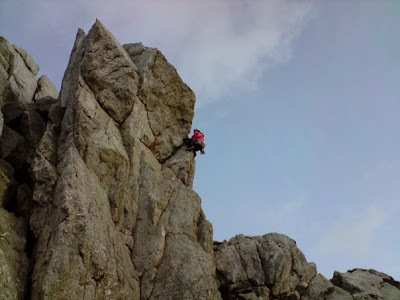 A report from Graham on his trip to Langdale on Saturday with Mark and AndyC. 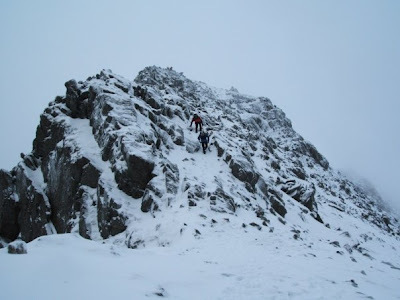 Having shunned an early start, we began the walk up Mickleden in Langdale with a fully pessimistic attitude. But as we neared the top of Rossett Gill the outlook suddenly appeared promising - as a selection of small but easy angled falls looked climbable. We continued up towards Angle Tarn on the premise that we could come back down to this if the higher icefalls weren't in nick. We could just make out the shimmer of ice through the fog, so we traversed round to the back of the tarn where the lower icefall was. 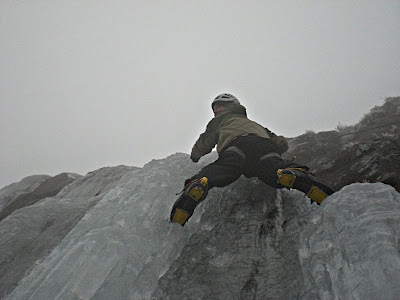 None of us had climbed water ice before, and this looked steep and also rather fragile in the not exactly sub-zero conditions, so Mark set up a top-rope for us to practice on. We were all rather tentative on our first try (as Andy C shows in the clip above! 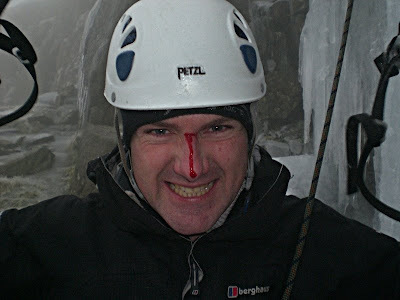 ), but on our second efforts we were already much more confident - Mark getting so aggressive that the ice had no choice but to fight back and give him a bloody nose. We checked out the upper icefall but this looked halfway melted, so on top of being damp and unpleasant would no doubt have been foolish and dangerous. Instead we walked over to Angle Tarn Gully. It's a grade 1 snow gully if banked out with snow. On Saturday, thoough, there was no snow. Just a frozen stream of water down one side - albeit at a much more amenanable angle to that of the icefalls. 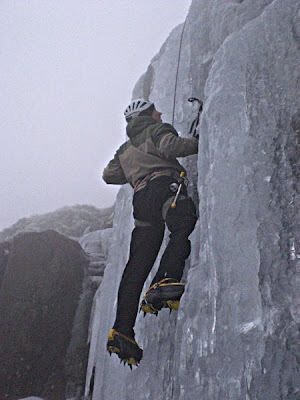 We put the ropes away and started up the gully - taking the steeper sections direct or avoiding them by stepping onto the frozen turf to the right of the gully at our own discretion. 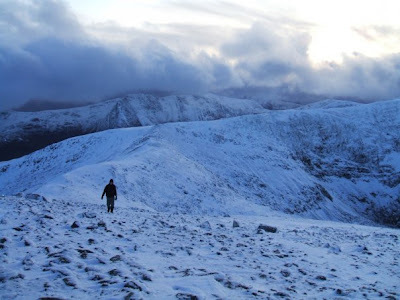 We emerged from the gully somewhere near the summit of Esk Pike - and after a few moments disorientation in the fog and encroaching darkness, we sensibly took a bearing, found the path, and started back down to the car. 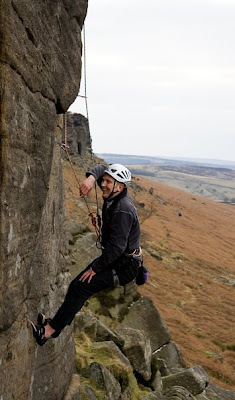 MarkD, AndyC, GrahamC and RichC were at Stanage on Saturday. Mark spent some time clocking up the air-miles on what is rapidly becoming his most worked project, Telli 10m 2* E3 6a. At least Graham seemed to find it all very amusing. Photographs stolen from RichC courtesy of Facebook.